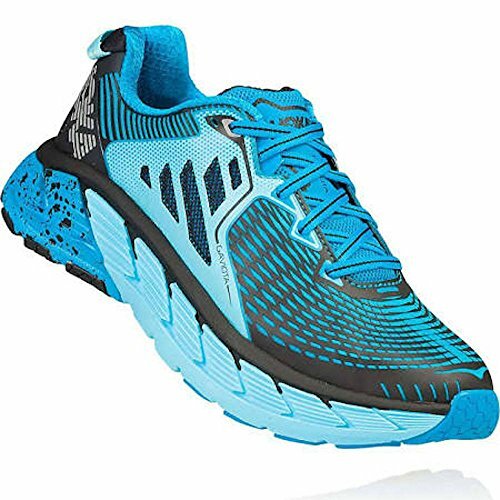 After their founding in 2010, Hoka One One’s running shoes have quickly become known in the industry for providing maximum cushioning in a lightweight shoe.While barefoot running and minimal shoes were the rage for a while, the pendulum has swung the opposite way and now max cushioned running shoes like Hokas are more popular than ever. 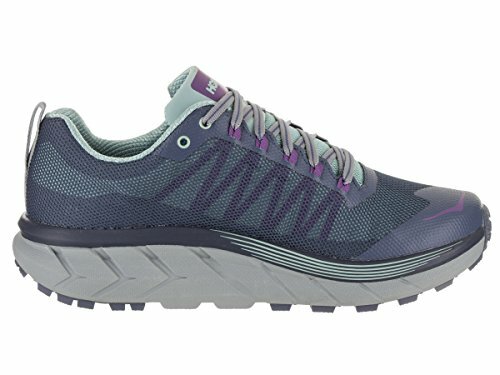 With great rebound properties and stability, Hoka One One’s shoes are designed with comfort and performance, whether to help in correcting pronation, for trail running, or for runners who want a cushioned ride. They have also found a niche with runners suffering from knee issues, plantar fasciitis, and other running injuries. Their pillow-soft cushioning lends itself to easing the pain in common injuries. 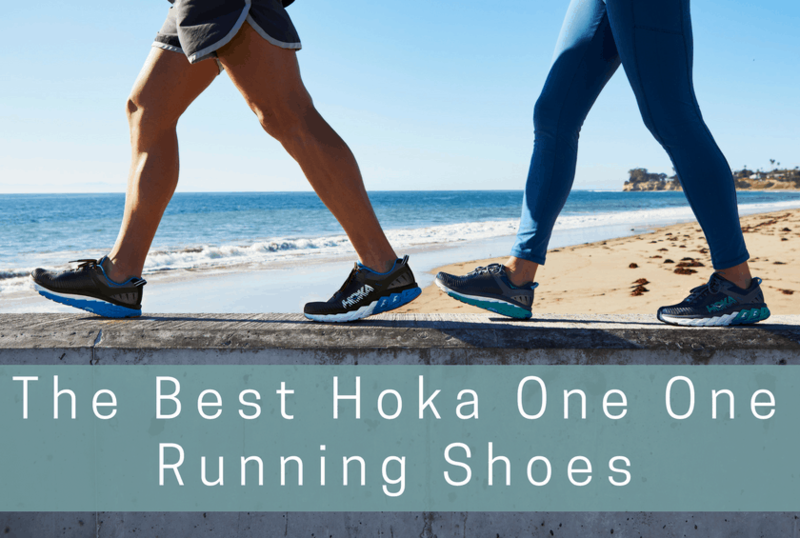 Below is our list of the best running shoes that Hoka One One has to offer. Hoka One One have made some impressive improvements to their Clifton with the model 5. Longtime fans of the Clifton will love how they’ve kept the impressive, thick cushioning of older models, while redesigning the shoe to be even more durable and comfortable. The new mesh upper of the Clifton 5 has impressive breathability. Its seamless construction helps reduce the possibility of irritation and blisters. The upper holds the runner’s foot securely in place while remaining flexible. Runners with wide feet will be glad to hear that the Clifton is also available in wide sizes. Despite its high midsole stack height, this shoe also has great energy rebound due a midsole made up of a single length of CMEVA foam. This foam is rockered, with upward tapering at both the heel and the foot, providing the runner with a springy bounce-off. Hoka has added a strip of rubber, which now covers almost the entire lateral side of the outsole, protecting the midsole from wear and tear. This has improved the durability of the Clifton 5, protecting the most vulnerable parts of the sole, keeping you running for longer. The Bondi 6 is one of Hoka’s most cushioned running shoes, providing comfort and stability no matter what distance you’re planning to run. With good arch support, and available in wide sizing, Hoka’s flagship shoe continues to be its leader in cushioning, comfort, and support. The seamless upper and generous toe box make this a supremely comfortable shoe. And with an upper designed of engineered mesh, it also has great breathability, with plenty of airflow. If you don’t mind standing tall in your running shoes, the Bondi 6 will give you a cushioned ride like no other. The cushioning, made of soft EVA foam, wraps around your foot as you sink in, for exceptional, “pillowy-soft” comfort. The compromise here is a bit of the responsiveness you would get from a less cushioned sole. High-abrasion rubber material makes for a durable outsole with great grip, should you choose to take these shoes off-road. A wide base with a moderate heel bevel helps to smooth out your transitions from heel to toe. The rocker in the sole takes some getting used to – but it helps make a smooth transition from heel to toe while running. And the shoe is fairly stiff, holding your foot in one place. This makes it ideal for runners suffering from arthritic toes or bursitis. A stable and comfortable shoe with durable construction, the Arahi 2 is ideal for stability as well as for runners who want more support. The upper features a breathable mesh to allow for air to circulate. It has a padded collar and tongue as well as evenly-spaced overlays, which hold the foot snug. The heel also features a pull-tab, making it easier to take on and off. The signature of the Arahi 2’s sole is the EVA J Frame. This J-shaped structure acts as the full-length sole but is what adds the support and stability. It curves from mid-foot to heel to correct overpronation. Also, Early Stage Meta-Rocker Geometry helps the foot to rock, smoothing out the ride. The outsole has good traction and slightly less of a rocker feeling than other Hokas. This puts the shoe in more contact with the ground, adding additional support. With its thick underfoot foam, the Gaviota is ideal for runners who need stability to correct overpronating. Its curved sole is meant to mirror the shape of the foot, making for a flexible, well-designed runner. The Gaviota has a lightweight, breathable upper featuring pull-tab on the heel to aid in taking the shoe on and off. The upper is designed to conform to your foot with mid-foot layers (called Arch-lock Wings) connected to the laces for added support. To prevent overpronation, the Gaviota is equipped with the patented “RMAT J-Frame,” a J-shaped frame meant to keep the foot in a neutral position. As you run, your roll is aided by Late Stage Meta-Rocker Geometry, creating a platform for toe-offs that will move you forward with less exertion. A bonus is anti-microbial, anti-moisture technology to keep the foot healthy. The outsole platform is made even more flexible with flex grooves that help move your foot smoothly through the gait cycle. The durable rubber of the outsole helps to protect the midsole from premature wear, while adding extra traction. 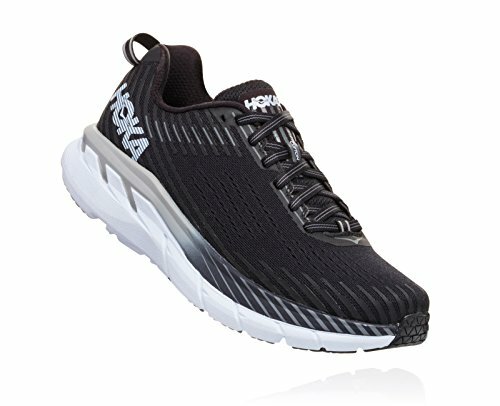 Hoka One One’s all-terrain running shoe, the Challenger 4 features a combination of good traction, responsive cushioning, and comfort. 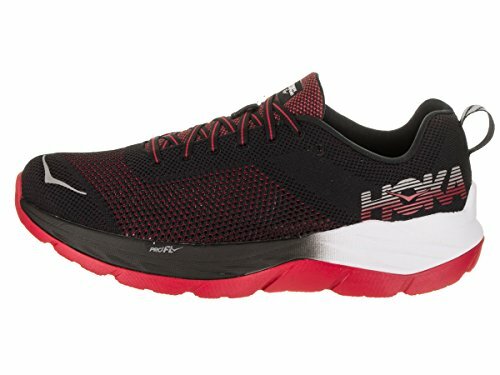 For a shoe with this wide a base, they are surprisingly light, while still providing Hoka One One’s signature cushioning. 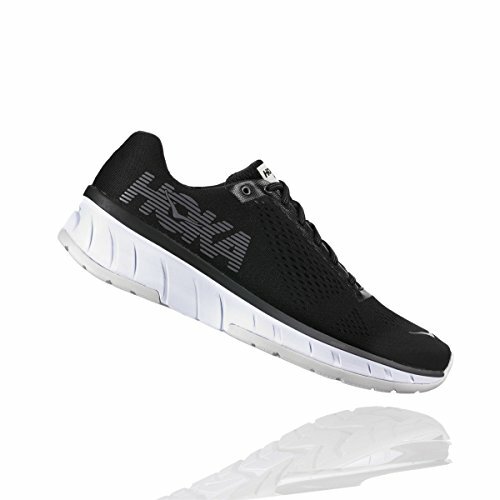 Hoka One One fans will notice that the upper has been scaled back from previous versions. But it makes the shoe lighter with extra breathability and comfort in a secure fit. Although there is less padding at large, the tongue remains padded to help prevent irritation and blistering. Despite the voluminous cushioning, the oversized EVA midsole makes for lightweight, responsive, and speedy ride. This shoe makes up for lost flexibility with their Early Stage Meta-Rocker technology, smoothing out the transition from heel to toe. The outsole features durable 4mm rubber lugs, giving you sufficient traction for off-road running. Note: there is no rock plate, so although the foam will protect you from debris on the trail, some users complain that it is not sufficiently tough for heavy trail action. 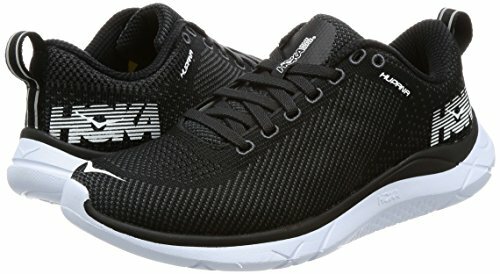 A comfortable, lightweight road shoe with a simple, attractive design, the Hupana is an ideal shoe for runners with a neutral gait or those who want a shoe for the gym. Hupana’s upper is made of lightweight fabric to allow air flow, while preventing blistering that can come with synthetic uppers. The structure of the upper comes from its welded overlays, which also make for a snug and secure fit. The entire sole is composed of one piece, called the RMAT, which provides ample cushioning in the midsole. The durable RMAT also gives the shoe good rebound, making for soft, secure landings as well as bouncy takeoffs. While not meant for trail running, the RMAT does have several cross-sections to improve traction. Flex grooves in the RMAT guide your foot through the gait cycle and make for a smooth ride. 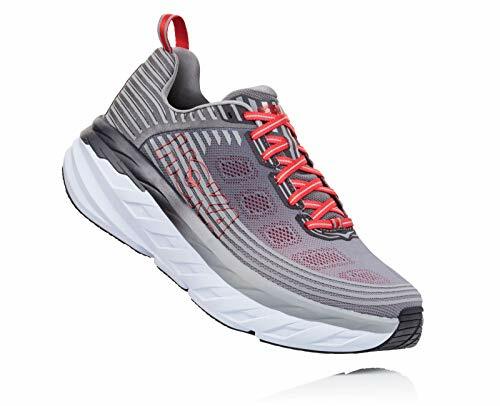 With a knit upper and a rubber outsole, the Hoka One One Mach is another lightweight, thickly cushioned shoe with neutral support that is ideal for both tempo and distance runs. The stability to weight ratio is exceptional, and the fit is a good blend of comfort and structure. The Mach, formerly known as the Clayton, features the Clayton’s lightweight and speedy design, but has a more narrow toe box. A fully engineered knit upper makes this shoe very dynamic and flexible. The knit also breathes well and dries fast. The wide platform provides plenty of room in the midfoot, but does narrow down near the toes. Softer in the heel and firmer in the forefoot, the Mach’s ProFly dual density system allows you to relax back onto your heels on long runs when form tends to break down. The two sections do overlap, though, which makes for a smooth transition from heel to toe. The durable RMAT gives you responsive cushioning as well as solid traction, making it capable of handling light (but not serious) trail running. The Cavu is a lightweight trainer for neutral runners. It’s responsive, fast, and well-cushioned. It works just as well for running as it does for walking and using in the gym. At $110, it’s also one of Hoka’s most value-oriented shoes. The upper is made of a stretchy engineered mesh. There are no overlays and a minimal toe bumper. Although it has a secure heel counter, the upper is mostly slipper-like, so there’s no worry about blistering or irritation. The ProFLY midsole gives the shoe a softer heel with a firmer forefoot so that landings are soft, but push-offs have some bounce. The transition between the two foams is seamless. On the forefoot and heel, the Cavu features RMAT, Hoka One One’s blend of midsole foam and rubber. Although it’s not as thick as conventional rubber, RMAT’s grip holds up well on standard surfaces but is not built for trail running. 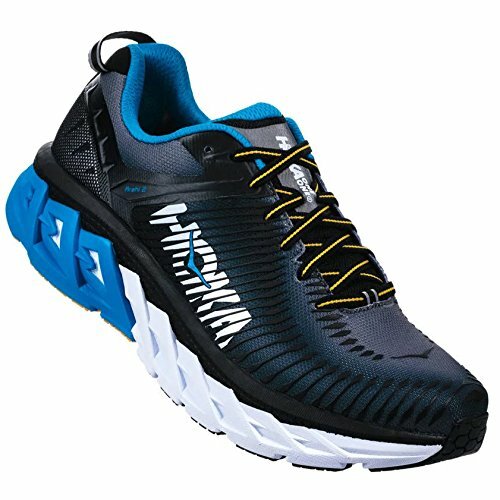 The Hoka One One Elevon is technologically advanced for premium support, stability, and comfort. 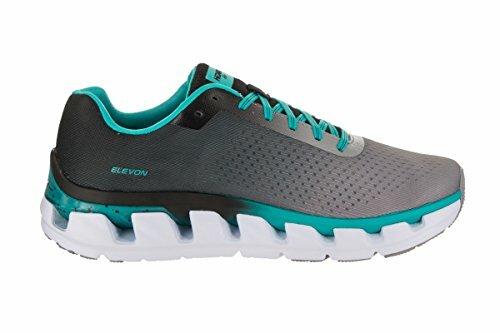 Ideal for runners with mild overpronation, the stability of the Elevon never interferes with its agility and speed. The upper is made from a highly breathable and lightweight mesh with large holes for ventilation. The seamless design reduces the possibility of irritation and blisters and makes sure that your foot stays cool and dry. Like other Hoka One Ones, the Elevon uses the dual midsole ProFLY technology, to combine a softer landing in the heel with a firmer, bouncier toe-off. The TPU clip in the heel has also been updated for more stability, and the ample cushioning makes for a responsive ride with plenty of shock absorption. The outsole on the Elevon is quite noticeable, with added rubber sections for durability as well as increased flexibility via flex grooves near the forefoot. The combination of these two elements makes for a smooth ride with high responsiveness. Hoka One One has become known in the running shoe world for their incredible cushioning and stability. Whether you’re looking to correct overpronation or for a great trail-running shoe, we hope this guide has helped you choose the Hoka One One running shoe for you.